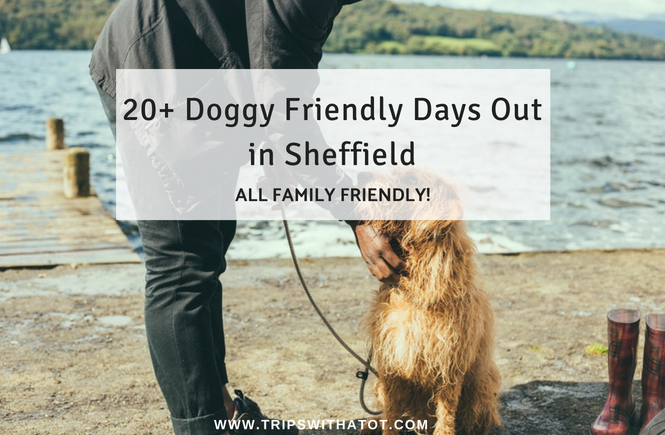 This one has been requested quite a few times over the last few months and although I don’t have a dog, I’m more than happy to put together a list of doggy friendly days out in Sheffield. 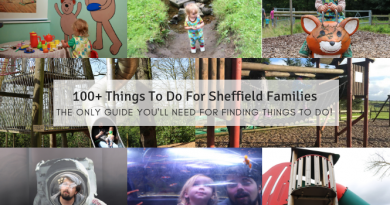 We spend a lot of time outdoors, in local parks, etc., so I already have a good idea of where the best spots are for kids and dogs, but I did some research and here’s 20+ Doggy Friendly Days Out in Sheffield! Please note: As I don’t own a dog, I’ve never taken a dog to any of these places so I’m not 100% sure about the allowed on leads/not allowed on leads rule so please double check that if you need to. One of my favourite days out & mentioned a lot is Forge Dam. 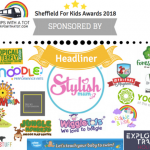 The cafe is great and dogs are allowed in the outside seating area (which is covered), there are ducks to feed, woodland walks, playground and trails up to Mayfield Alpacas or down to Endcliffe Park. Does your dog love a paddle? We sure do; Forge Dam is a great wild paddling spot! Read 6 reasons why you’ll love Forge Dam. 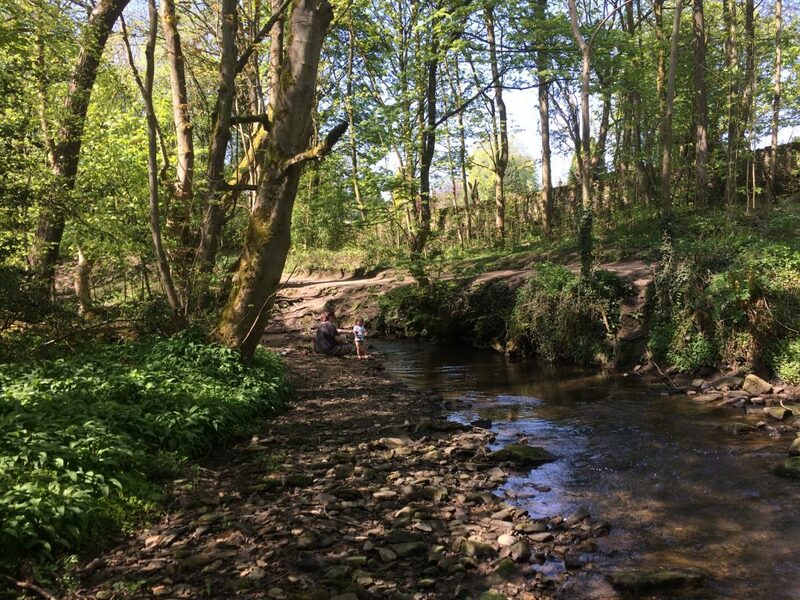 Ecclesall Woods is a wonderful place for a peaceful doggy friendly woodland stroll, plus the woodland coffee stop – a fine food & drink kiosk with good food and drinks. They offer free dog biscuits and bowls of water. There’s a playground, Bishops House (open on weekends, dog not allowed inside though) and a walled garden at Meersbrook Park. I used to live in S2 and we went to Norfolk Heritage Park quite often… I think it’s underrated and even more so the Norfolk Park Heritage Trail. 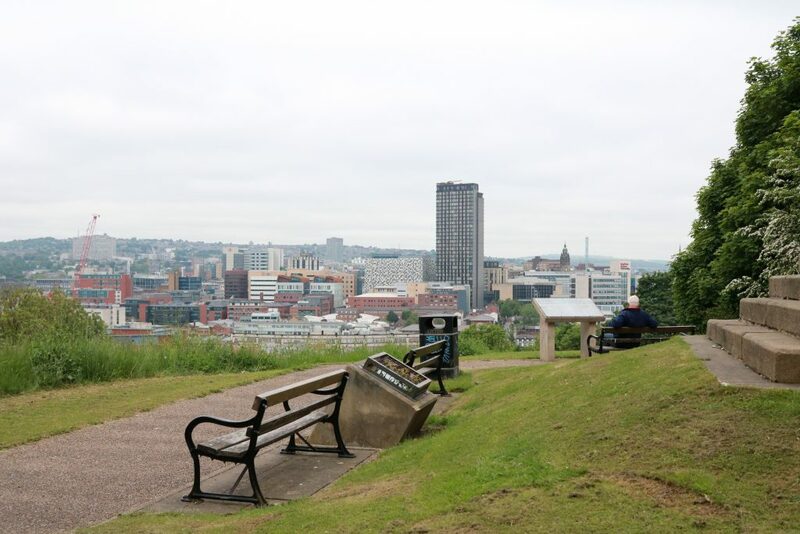 All places on the Norfolk Park Heritage Trail are dog friendly, but a quick way to start this would be from the Sheffield amphitheatre (at the back of Sheffield train station) follow the paths up to Cholera monument & woods, and eventually you’ll get to Norfolk Heritage Park. There is a cafe and adventure playgrounds. This park in s6 is really great and there’s always loads of dogs running around exploring off lead. You’ll love the nature trail, cafe, good playground and there’s even a water park. While dogs aren’t allowed in the playground/water park there’s lots of woods to explore and dogs are welcome outside the cafe (with seating). 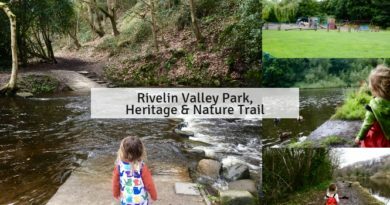 Read 6 reasons why you’ll love Rivelin Valley Park. This is another place I used to go quite a lot when I was living in S2, and this is part of the Norfolk Heritage Trail I mentioned above. 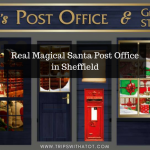 Sheffield Manor Lodge is an attraction in Sheffield, I’m sure dogs are not allowed in there but the park the manor lodge is located on is always open and dog friendly. There’s little paths to explore, a big slide, some rocks and old steel work sculptures. See my post here. If it’s been raining, it’s a good spot for puddle splashing. I recommend starting from the top and walking down to Rhubarb Shed Cafe; plenty of outdoor seating so perfect for dogs and there’s outdoor toys for children, too (photos). Dogs are allowed around the gardens and grounds on leads at Renishaw Hall. Dog bowls and free biscuits are outside the cafe and there’s plenty to do to keep all ages entertained. I’ve heard it’s a particularly wonderful place in spring for bluebells. At this alpaca farm dogs are allowed around on the farm trail as long as they’re on short leads which are not extendable. There is a cafe and inside animal house (dogs not allowed) but lots of friendly animals to see outside and a dog friendly pub around the corner too: The Norfolk Arms. 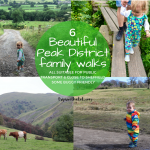 We love a day out at Low Bradfield; the countryside but only 5 miles away from Sheffield. Dogs are allowed around a walk at Damflask Reservoir which is flat path, so suitable for pushchairs and scooters, too. There’s a big bowling green in the village, dog friendly post office and dog friendly pub The Plough. This place is a true hidden gem and only open on certain times in the year, but dogs are welcome (sorry, not allowed on the trains though!) and you can set up picnic on the green. 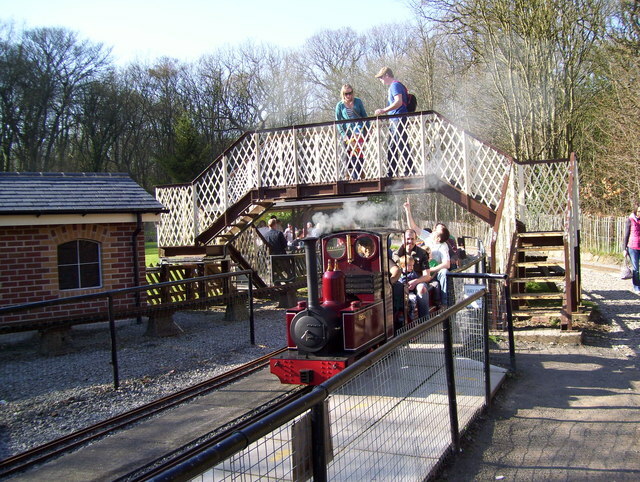 Rides are £1.50 and all ages will love it, it’s a real novelty. Read our review here; we were really surprised on our first visit. Dogs are allowed around the walled garden and garden centre so long they are on leads. They are not allowed inside the restaurant or playground/farm areas, however. There is covered outdoor seating for dog owners at the restaurant. There are a few pubs in Wentworth which are doggy friendly, too, and The George & Dragon has a large doggy friendly beer garden. 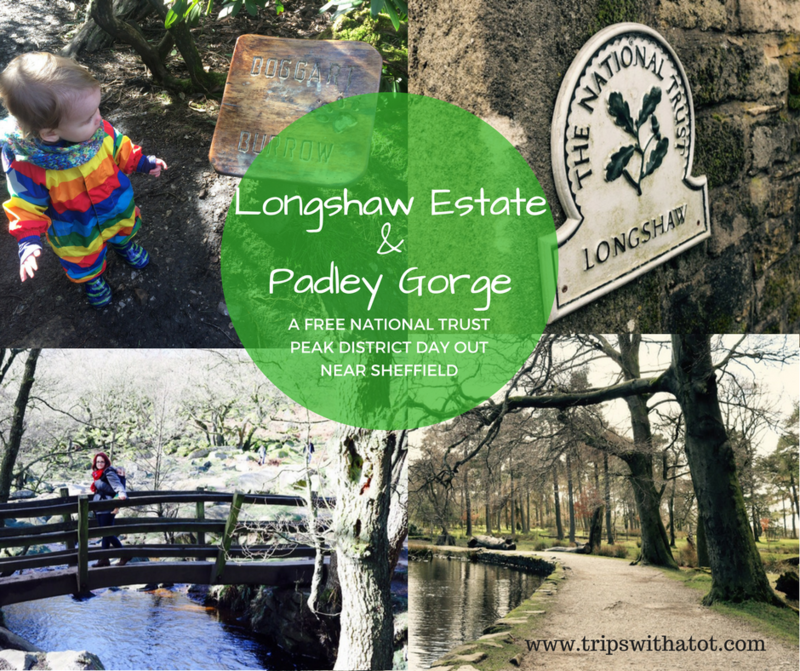 If you follow my blog you’ll know we love Longshaw Estate! 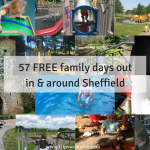 It’s an amazing free day out for all ages and the walks there are fantastic, suitable for all. 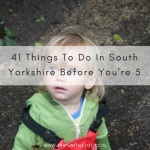 I really recommend the Bogart trail for kids and walking down to Padley Gorge. It’s a very doggy friendly place, but be aware between 1st March until 31st July each year it is law to keep dogs on a lead due to live stock. There is a cafe which has dog friendly seating outside and bowls of water. Dogs are not allowed inside the museum but they’re most welcome to roam the gardens. There is no entrance fee and lots of paths to explore. Outdoor patio seating at the cafe, too. 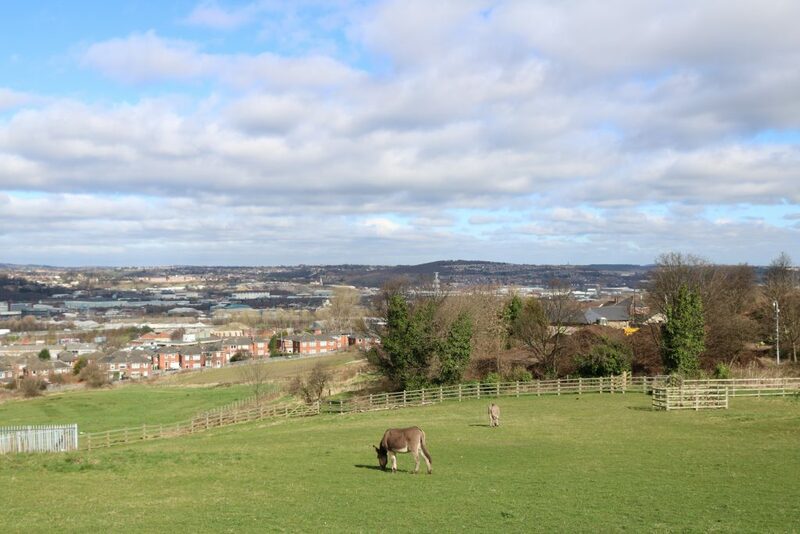 If you wish to go to Cannon Hall farm or shops, dogs are not allowed but there are kennels available. 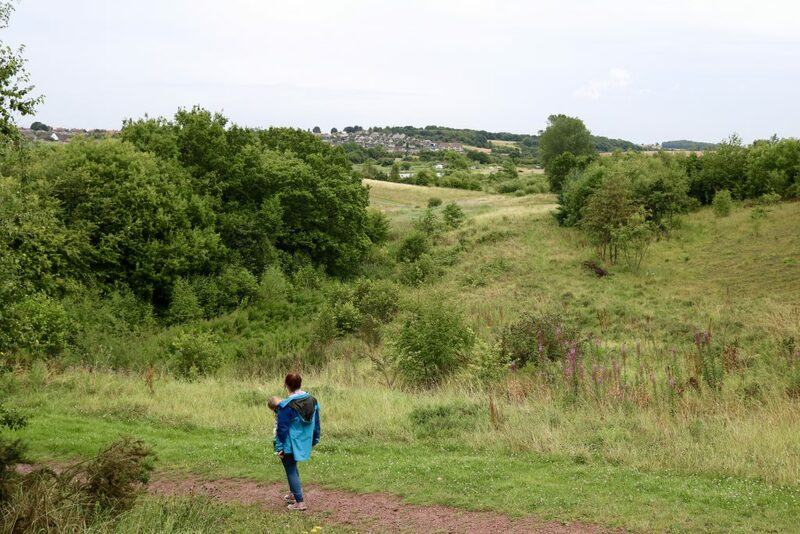 Rother Valley is free and well behaved dogs are allowed without being on a leash. 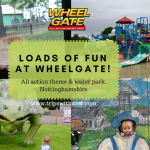 You could easily make this a fun day out as there’s lots of sporting activities, petting farm, playground, cafe and picnic areas, too. We’ve been here before (read my review and see photos) and I was pleasantly surprised; it’s a good place for wildlife and nature. Dogs are allowed off-lead, too. Dogs are allowed in the play areas, just not in the sand pit. The playgrounds are newly renovated with fantastic adventure play equipment and there is a cafe, too. Not Sheffield but in Wakefield; it definitely deserves a mention, though! Does your dog love the childrens book Room on the Broom? Well they’re in luck because they can enjoy an off-lead walk at Anglers Country park for free and meet the characters from the book! 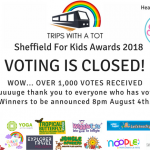 🙂 Free car parking, visitors centre, cafe with outdoor seating and playground, too. It’s a great day out; very muddy though! Rumour has it that dogs can even go on the trams at Crich Tramway Village in Matlock! (I hope they don’t have to pay!) Haha… the whole attraction is doggy-friendly and it’s a popular family day out, too. There’s over 60 retro trams and unlimited tram journeys calling at various stops along the mile long track. I recently just found this playground which is in a big field with stunning views out to the countryside! Because it’s not fenced off, it’d be perfect for dog owners with kids and it’s just across the road from Admiral Rooney pub for food & drinks, too. This pub is in the perfect location for fantastic walks, I really love a walk around Lodge Moor it’s very beautiful and one of my favourite walks in general. You can begin/end the walk at Three Merry Lads which is doggy friendly and there’s a good play area in the beer garden, so dogs can happily play ball while the kids enjoy playing. The Millstone, Hathersage lets dogs in and they have some animals in the car park. Rising sun at Fulwood allow dogs inside. The cafe at Hathersage Outdoor Pool allow dogs outside one patio, there is also a good playground behind the pool which is not fenced. Grindleford train station have a cafe and allow dogs outside and in the undercover section. Do you have any you’d like to add? If you are a dog owner and know some fantastic dog friendly days out, cafes, pubs, etc., then please send them in and I’ll add them to this list! 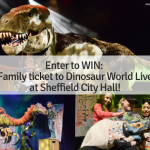 Share this post and subscribe to my blog for more helpful Sheffield days out posts. I love that you shared the pubs that are dog friendly too, those are the most important!